Roundhouse is a term applied by archaeologists and anthropologists to a type of house with a circular plan, usually with a conical roof. In the later part of the 20th century modern designs of roundhouse eco-buildings started to be built using techniques such as cob, cordwood or straw bale walls and reciprocal frame green roofs. A reconstruction of a British Iron Age Celtic roundhouse. Roundhouses were the standard form of housing built in Britain from the Bronze Age throughout the Iron Age, and in some areas well into the Sub Roman period. 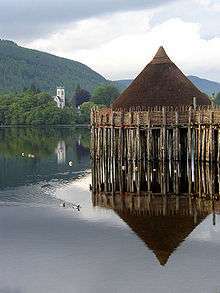 They used walls made either of stone or of wooden posts joined by wattle-and-daub panels and a conical thatched roof and ranged in size from less than 5m in diameter to over 15m. 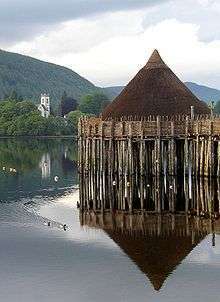 The Atlantic roundhouse, Broch and Wheelhouse styles were used in Scotland. The remains of many Bronze Age roundhouses can still be found scattered across open heathland, such as Dartmoor, as stone 'hut circles'. Most of what is assumed about these structures is derived from the layout of the postholes, although a few timbers have been found preserved in bogs. 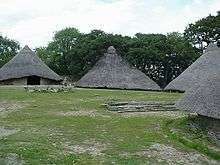 The rest has been postulated by experimental archaeology, which has shown the most likely form and function of the buildings. For example, experiments have shown that a conical roof with a pitch of about 45 degrees would have been the strongest and most efficient design. !Raincliffe Woods Scarborough North Yorkshire England Roof destroyed by fire April 2013. Timbers and thatch removed by Scarborough Conservation Volunteers. Walls undamaged. New designs of roundhouse are again being built in Britain and elsewhere. 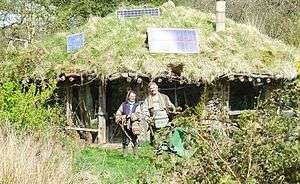 In the UK straw bale construction or cordwood walls with reciprocal frame green roofs are used. There is one manufacturer of contemporary Roundhouses in Cheshire, England, using modern materials and engineering to bring the circular floorplan back for modern living. That Roundhouse is an early example of a modern roundhouse dwelling which was built in Pembrokeshire Coast National Park, Wales without planning permission as part of the Brithdir Mawr village which was discovered by the authorities in 1998. It is constructed from a wooden frame of hand-cut Douglas Fir forest thinnings with cordwood infill, and reciprocal frame turf roof based on permaculture principles mainly from local natural resources. It was subject to a lengthy planning battle including a court injunction to force its demolition before finally receiving planning approval for 3 years in September 2008. Trulli (singular: trullo) are houses with conical roofs, and sometimes circular walls, found in parts of the southern Italian region of Apulia. 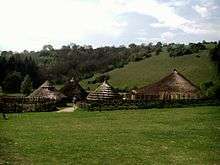 A palloza is a traditional thatched house as found in the Serra dos Ancares in Galicia, Spain, and in the south-west of Asturias. It is circular or oval, and about ten or twenty metres in diameter and is built to withstand severe winter weather at a typical altitude of 1,200 metres. The main structure is stone, and is divided internally into separate areas for the family and their animals, with separate entrances. The roof is conical, made from rye straw on a wooden frame. There is no chimney, the smoke from the kitchen fire seeps out through the thatch. As well as living space for humans and animals, a palloza has its own bread oven, workshops for wood, metal and leather work, and a loom. Only the eldest couple of an extended family had their own bedroom, which they shared with the youngest children. The rest of the family slept in the hay loft, in the roof space. Round houses can be found in various countries in Africa,. In South Africa they are known by the Afrikaans word rondavel. Modern roundhouses are being built such as the one at Dancing Rabbit ecovillage near Rutledge, Missouri, built of cob. Roundhouses are still in use in Papua New Guinea and are very similar to the ones built in western Europe. ↑ Aston, Mick (2001-10-05). "Peter Reynolds: archaeologist who showed us what the Iron Age was really like (obituary) In Africa a round house was found on a volcano". The Guardian. London. ↑ "Secret village to be pulled down". BBC News. 1998-10-23. Retrieved 2009-04-12. ↑ Barkham, Patrick (2009-04-12). "Round the houses". The Guardian. London. Retrieved 2009-04-12. ↑ Eric Rosenthal (1961–1978). Encyclopaedia of Southern Africa. London: F. Warne. p. 35. ISBN 0-7232-1487-5. ↑ "Raun Haus / Round Haus". Wikimedia Commons has media related to Round houses.